While it had its "Capra ending," Mr. Smith Goes to Washington (1939) was an otherwise fairly dark film—much like It's a Wonderful Life would be a few years later. Jimmy Stewart starred as the wet-behind-the-ears interim state senator Jefferson Smith, appointed because the likes of Senator Joseph Paine (Claude Rains) and others in power assume he'll be naive enough to back a conspiracy to make them richer. 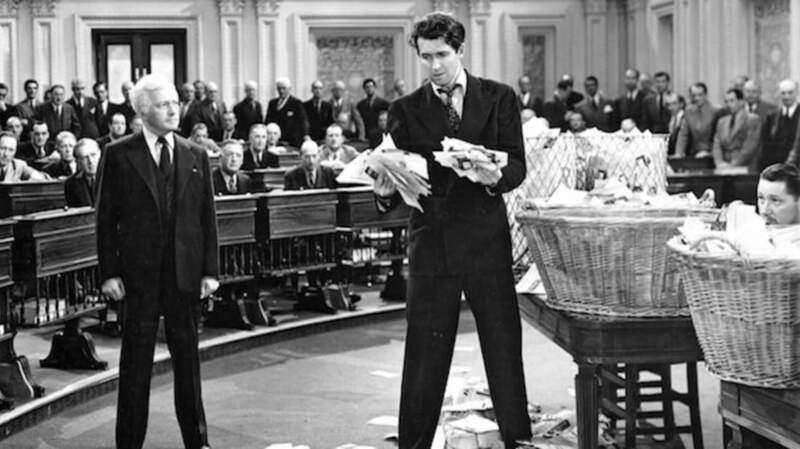 Stewart's character has his reputation ruined by Paine when he threatens to expose them all, culminating in a 23-hour filibuster by Smith to Congress, as suggested by his seemingly one ally, his secretary Clarissa Saunders (Jean Arthur). Not surprisingly, real-life American politicians weren't crazy about how they were portrayed. 1. IT WAS MEANT TO BE A SEQUEL TO MR. DEEDS GOES TO TOWN. Initially, director Rouben Mamoulian bought the rights to Lewis R. Foster's unpublished story, "The Gentleman From Montana" (known elsewhere as "The Gentleman from Wyoming"), for $1500, which he then sold to Columbia Studios chief Harry Cohn at the same price in exchange for the chance to direct another movie. In 1938, Columbia and Frank Capra issued a press release announcing that Capra's next movie would be Mr. Deeds Goes to Washington, starring Gary Cooper, the lead in Mr. Deeds Goes to Town (1936). But Cooper was not under contract with the studio, and negotiations to make the film as it was originally envisioned eventually stalled. Capra was able to get James Stewart on loan from MGM, and the title was changed. Capra later said that Cooper was too old to play the naive Jefferson Smith anyway. 2. FRANK CAPRA HAD TO DEAL WITH SOME TECHNICAL ISSUES. Because he wanted to rely on natural reaction shots in the three-tiered Senate chamber, which was recreated on a sound stage exactly as it was in Washington, D.C., Capra needed to employ what was then a unique multiple-camera, multiple-sound approach so that he could shoot multiple scenes before moving all of the filming equipment somewhere else. "Had we tried to photograph the Senate with the usual single camera, 'jackassing' tons of heavy equipment (lights, sound booms, camera platforms) for each single new set-up—we might still be there," Capra wrote in his 1971 autobiography. 3. JIMMY STEWART CALLED IT "THE ROLE OF A LIFETIME." Having declared the part "the role of a lifetime," Stewart was determined to make sure he completed the film. "He was so serious when he was working on that picture," Stewart's co-star, Jean Arthur, recalled. "He used to get up at five o'clock in the morning and drive himself to the studio. He was so terrified something was going to happen to him, he wouldn't go faster." 4. STEWART WAS GIVEN PERFORMANCE-DIMINISHING CHEMICALS. To make his voice hoarse, as if he really had been filibustering for 23 hours, Capra wrote that, "Twice a day Jimmy's throat was swabbed with vile mercury solution that swelled and irritated his vocal cords. The result was astonishing. No amount of acting could possibly simulate Jimmy's intense pathetic efforts to speak through real swollen cords." 5. HARRY CAREY HAD SOME TROUBLE WITH HIS LINES. Harry Carey was brought in to play the President of the Senate. The 60-year-old kept blowing his lines until Capra cornered him after a lunch break. He asked the actor who he was. "Well, Harry Carey, of course." "No, you are the Vice President of the United States," the director told him. It did the trick. 6. THE BOY SCOUTS OF AMERICA WANTED NO PART OF THE FILM. Jefferson Smith helps out the fictitious Boy Rangers, and not the Boy Scouts, because the latter group made it clear to Capra that they didn't want to be associated with the film. Capra, having already filmed some scenes in which the Boy Scouts were mentioned, had to lose that footage. 7. THE SUICIDE ATTEMPT WAS CAPRA'S IDEA. Sidney Buchman was the credited screenwriter on Mr. Smith Goes to Washington, but Capra had a big say in the final draft of the script. One of Capra's contributions, which Buchman hated, was Senator Paine's suicide attempt. 8. IT ORIGINALLY ENDED WITH A PARADE. The movie originally ended with Jefferson and Saunders returning to Smith's hometown, following the filibuster, for a parade in his honor. Smith also visited Paine to forgive him, as well as his mother, to get her blessing to marry Saunders. Test audiences didn't seem to love this ending, so Capra cut it, though some of the original ending still lives on in the film's trailer. 9. COLUMBIA PREEMPTIVELY ADDRESSED A PLAGIARISM LAWSUIT. As Capra was finishing final edits on the film, the legal department at Columbia discovered a Pulitzer Prize-winning play called Both Your Houses (1933) by Maxwell Anderson that was a bit too similar to Mr. Smith Goes to Washington for their comfort, legally speaking. They paid $23,093 for the rights to it so they wouldn't get in trouble later. 10. ONE SENATOR CALLED IT "SILLY AND STUPID." The Washington Press Club screened the film at Constitution Hall with a number of congressmen, senators, and Supreme Court justices in attendance. Capra claimed that a third of Washington's finest left, in disgust, before the film even ended. Senate Majority Leader Alben W. Barkley described the movie as "silly and stupid" and complained that it "makes the Senate look like a bunch of crooks." 11. JOSEPH KENNEDY DIDN'T WANT THE FILM TO BE SEEN IN EUROPE. Joseph P. Kennedy, the U.S. Ambassador to the United Kingdom (and patriarch of the Kennedy clan) sent a cable to Harry Cohn and Capra claiming, according to Capra, that Mr. Smith "ridiculed democracy" and would "do untold harm to America's prestige in Europe." He begged them to withdraw it from distribution in Europe. The two mailed Kennedy favorable reviews of the film, which appeased the ambassador enough that he backed off.